By now you will have noticed all the excitement over our new theme trailer but if you have, by some miracle, missed out on the news click here to catch up. 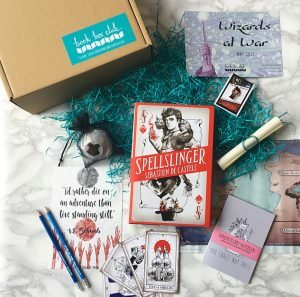 We are so excited to share our Spells & Remedies boxes with you because we think that you are going to LOVE the magical featured book and because we have some really incredible crafty suppliers lined up. If you are a fan of The Raven Boys, our December read Bone Gap, or the writing of Laini Taylor then you are going to be utterly enchanted by our July featured read and the best news is; the author has confirmed that they will be attending our members only Clubhouse meeting, so all our lovely July members can ask questions and discuss! If you’d like to join us for our July box you can sign up here. We love seeing all your lovely unboxing photos and videos and this month we we thrilled to see so many of you enjoying your May Wizards at War boxes. The time has come to show anyone who missed out exactly what we included in the box. Wizards at War was such a fun box to put together (not just because we are such massive wizard fans) and we worked with some brilliant people on box items so we’d like to say a massive thank you to everyone for their help and creativity and of course a huge thanks to our members; you literally put the Club in Book Box Club and you rock! Spellslinger by Sebastien de Castell: Being at the heart of a magically talented family is tough when your own wizarding skills are waning. Kellen is on a deadline to prove his talents as a mage, but when a mysterious wildcard arrives in town, he finds himself drawn in to a world of wit, wonder, war and aggressive furry animals! Scrolled invitation to The Clubhouse book group: Join us for bookish chat about Spellslinger and all things wizardly in our members-only online book group, with special guest author, Sebastien de Castell. Wizarding pencils by Book Box Club: Even wizards need to take notes… Our wizarding pencils can also be used as wands (just add a little imagination)! Bookish goodies: With thanks to our friends at Hot Key Books, Simon & Schuster and Bloomsbury. 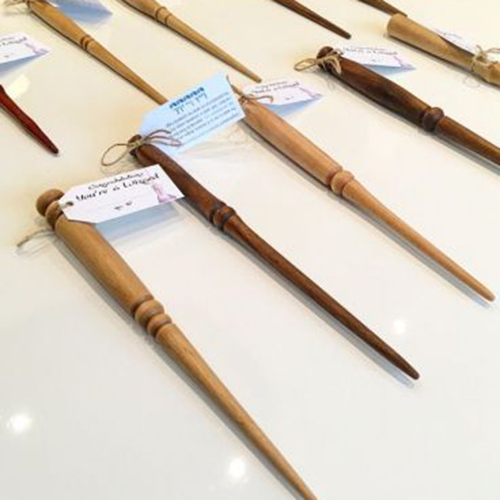 The other very exciting item we included in ten lucky boxes was a handmade wizarding wand made by the very talented Neil (@a_woodworkers_son). These wand winners were chosen at random following our Instagram competition so congratulations to all of the lucky winners. Each of the wands are slightly different and uniquely magical, time to go and practice your spell casting! Thank you so much to Neil for his creativity and enthusiasm! So that’s it folks! Does anyone else feel distinctly more prepared for a wizarding battle now? What house did your Sorting Hat bath bombs put you into? We’d love to hear about it. Keep your photos coming on our social media and don’t forget to tag us so we don’t miss anything!